Thembalitsha is the Xhosa word for New Hope and they aim to bring new hope to the desperate and needy people of South Africa, developing them to a point of self-reliance through the provision of healthcare, education and training. The organization started in 1997 and now runs seven projects in the western cape of South Africa. School of Hope offers hope through education for Youth at Risk (those who have dropped out of or forced out of school due to issues like gang warfare, teenage pregnancy, neglect, homelessness etc.) and Vulnerable Youth (those in danger of dropping out of school due to being orphaned or abused). These young people want to continue their education but need a specialized environment in which to do so. 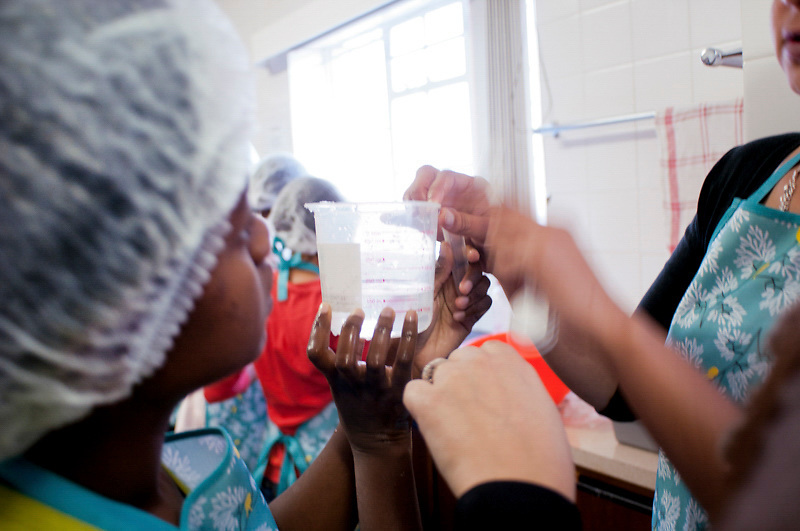 As part of their curriculum, students are taught how to cook healthy meals. Here, a few of them measure water in a measuring cup before putting it into a bowl.